Recently, I spoke at SMX Toronto about three under-appreciated or often overlooked video ranking factors and how to optimize YouTube videos to encourage the them to show up in universal rankings. One of the factors I talked about was one that any SEO should already really be familiar with: Inbound links. It seems to me that, either because of the unique format of a YouTube video page, or for some other reason, people forget that it’s just a web page like any other web page on your site or any site. When you want your site to show up on the SERPs and you’ve already taken care of any on-page issues and optimization, you build links. Under the video that you’d like to research is the YouTube Share button. When you click on it, you get the YouTube shortened URL. Next, simply do a Google search to see who has that link on their page. The resulting SERP has a lot of social media sites listed on it, but if you scroll past the Twitter and FaceBook results you get to some nice blog pages and such that offer dofollow links. The awesome upshot of this is that you can get a whole boatload of potential twitter followers and facebook fans. After all, if that Tweeter is sharing this particular link then why not yours? Talk about views…. 3. Getting Links From Within Youtube. 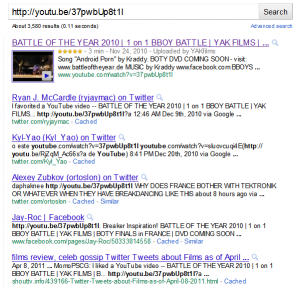 In Google, set advanced search results to display 100 results. Contact and start relationships with people in the resulting list. The highlighted entries are the ones that I thought would be the most worthwhile to start a relationship with. Why? Look at those channel view statistics. By the way, if you include the word “views” in your advanced search operator search, you’ll get much more detailed information with regards to channel views in the meta descriptions that you can pick apart, at least most of the time. 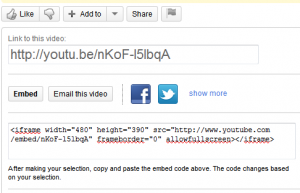 So there you have it, 3 ways to increase the actual links to your Youtube video page. Go forth and optimize!